Choosing the right dumpster company in Bettendorf, Davenport, Moline, or Rock Island doesn’t have to be difficult- It’s actually as easy as ordering a pizza once you’ve done your homework. The internet can make the process of finding a reliable waste management company as easy as clicking a mouse and making a single phone call, but it can also be confusing, frustrating, and expensive as many companies advertising on the net aren’t really what they pretend to be. Internet trash brokers, claiming to be local companies, have found a way to scam Quad Cities residents and business owners into placing dumpster rental orders at high prices with hidden fees and poor service with entities who really aren’t local and don’t have any trucks. These brokers sell dumpsters at inflated prices to unsuspecting customers, then attempt to sub contract the actual dumpster delivery to local waste haulers. Problem is, the broker doesn’t always convey the right information to the subcontractor, leaving the customer less than satisfied when dumpsters don’t arrive on time or aren’t placed in the desired location. So the moral of the story is make certain you’re doing business with a true local waste company before placing an order. The Quad Cities has a plethora of reliable waste management firms, some specialize in dumpster rental, some in residential waste collection, some only provide recycling services, and others provide all services from commercial garbage collection to co mingled recycling collection. Dumpster Rental Quad Cities focuses on junk removal and roll off dumpster rental. This focus enables us to provide the highest quality dumpster rental in the area as evidenced by the level of satisfaction expressed by our first-time and repeat customers. Wether its waste removal, red mix concrete, restaurants, or manufacturers, the best companies to do business with are those who value the communities in which they operate. We strive to be part of the Quad Cities community, to add value to the area, to operate in an ethical way to enhance our customer’s experience and the quality of life for all residents of this area. We think we’re hitting our mark, but are always receptive to constructive criticism from folks who think we can do better. So wether you choose to do business with our small garbage collection company or a nation wide waste removal company, you’d be well service to spend your money with a firm that treats it’s customers and employees fairly, respects the role of government/laws/regulations, and gives back to the Quad Cities area. The bottom line is, will your dumpster be delivered on time, placed in the right location, without damage to your fence/house/car parked in the driveway, etc. The caliber of drivers behind the wheel of America’s trucks isn’t what it used to be as we’re experiencing a nation wide driver shortage. So companies need to pay a little more, charge a little more to ensure the quality of their workforce is conducive to the safe operation of large dumpster delivery trucks. 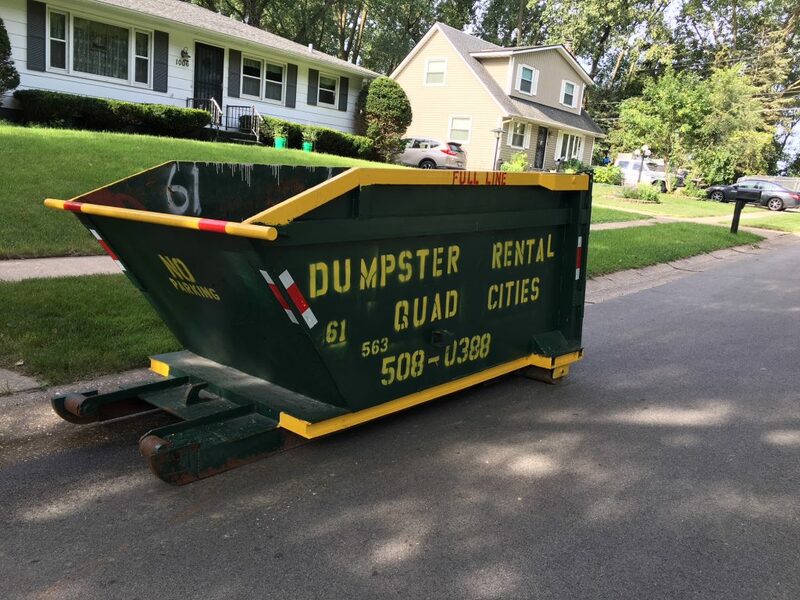 Dumpster rental in the Quad Cities isn’t cheap, so you deserve a professional and experienced driver to show up in exchange for your hard earned money. Dumpster Rental Quad Cities hires and trains only quality drug tested individuals who meet all Iowa Department of Transportation requirements to maneuver our well maintained vehicles through the tight alleyways of the Quad Cities area.